I have been so excited for the Zoella beauty range to come out and was happy when I finally got some of the products!! :) I was going to buy a makeup bag as well, but they had all sold out when I first got my Zoella beauty products. I also want to get the shower cream!! There had been such a hype around the release of Zoella beauty and shelves were practically half empty as soon as the products were put out. It's not really a surprise that the range is doing so well. Teenage girls can relate with Zoe Sugg and feel connected to her by watch her vlogs, so I'm not at all shocked by the success of her products. The products smell incredible and are so nice!! :) Plus the packaging is so pretty and cute. The candle has a gentle blend of white wood accents, sweet vanilla and soft floral notes. The packaging is so cute and I absolutely love the polka dots on all the products. The fragrance is awesome and has made my room smell fantastic. It feels like Summer in my room, when it's actually pouring down with rain outside and freezing cold. £5 is a bit expensive for a candle and it isn't overly big but I bought it anyway as I wanted to try out most of the Zoella range. I am glad I bought it and would definitely buy it again. The body lotion is divine!! It leaves my skin feel smooth and silky, with an incredible fragrance. It is not badly priced as well, £5 for a body lotion is a good deal and the bottle is quite big so it will last for a while. :) It is enriched with Vitamin E, Aloe and Shea Butter to soften and condition the body. It is worth buying again and this would be the perfect stocking filler, Superdrug should do a Christmas gift set of Zoella beauty that would be amazing and it would sell out straight away. 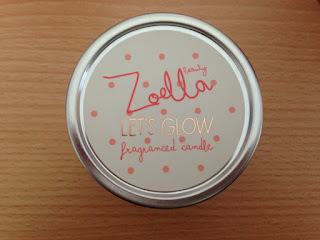 The Zoella range is beautiful and the product are really good! I definitely hope she expands into makeup, lipsticks would go perfectly with the current packaging. I hope she does come out with cosmetics next as here makeup in her videos always looks fantastic and she has good taste.